A couple years ago, I had the pleasure of going to Fäviken, the celebrated restaurant in Northern Sweden near Åre, Sweden's largest ski resort. It was like entering into a winter fairy tale, walking from the candle lit pathway dug out of the snow into the sparsely decorated barn-like interior of the restaurant, where dried mushrooms were hanging, a fire burning, and a bear coat was casually hanging in a corner. We had brought our two boys along with us and after we had sat us down, the attentive staff informed us that they had prepared a special non-alcoholic drinking menu for the boys. For each course of the meal, they brought the boys a different drink and made them guess what was in the drink. Many of the flavors we could guess and were familiar tasting. But one was competely new to us. A honey flowery scented drink. It was delicious but elusive. What could it be? They told us it was flavored with meadowsweet, an herb. 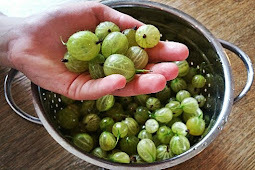 I kept this nugget of knowledge in my brain, intending to look up the herb at some point....and this summer, many years after that beautiful Fäviken dinner, the nugget resurfaced and I looked it up. 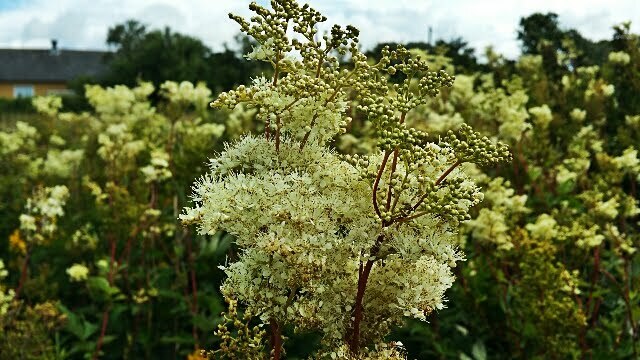 The scientific name for Meadowsweet is Filipendula ulmaria. In Swedish it is called älggräs. The plant has small white flowers which have a strong distinctive smell like honey and almonds. The leaves are also fragrant with a different sweet scent with a more grassy note. The entire plant, incuding the root, has medicinal uses. It is mentioned by Chaucer and was a favorite of Queen Elizabeth I to strew in her apartments to keep them smelling sweet. In the middle ages, it was often called meadwort because its flowers were used to flavor mead and is still used today to flavor beers. 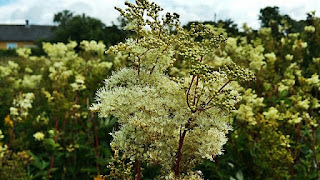 Even more interesting, I found that meadowsweet had been used to make aspirin! 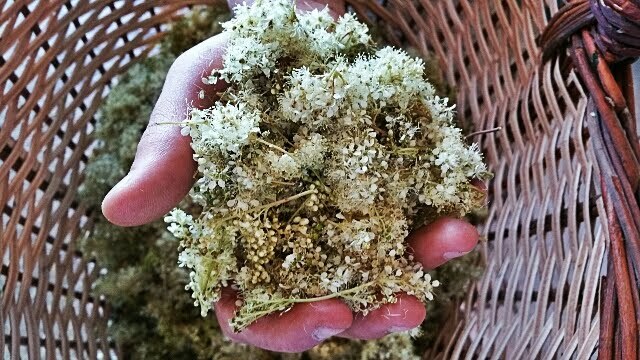 Like willow, meadowsweet contains pain relieving compounds and in the 1800s, they experimented distilling the chemicals that relieve pain from the plant. Bayer named this new compound "aspirin" after the old scientific name of meadowsweet which was then called spiraea ulmaria. Later scientists realized that that the drugs they had made from willow were the same as those from meadowsweet, namely salicylic acid. 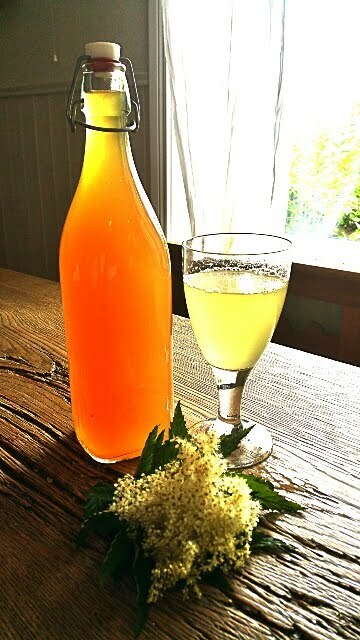 I found that there are many recipes for meadsweet cordial, so I had to try it. As has become my routine, I showed the picture of the plant to my son, Gustaf. He said, "Oh yeah, that's everywhere." I gave him a look which he understood to mean, "Get me some now". He ran off and returned ten minutes later with a large handful of flowers. I smelled them and compared them to the pictures, and voila! I had meadowsweet. I rushed to the kitchen and boiled up some sugar water and poured it over the flowers. I tasted. It was delicious. The flavor was flowery and aromatic with very strong almond notes. It had a slight bitter after taste. After some research, I determined that this was due to the salicylic acid in the plant and could be minimized by stripping the flowers from the stems. Yesterday, Gustaf and I went out with a basket and picked a huge bunch of flowers and made the cordial again. In order to save a lot of work picking out the stems, I recomend that you strip the flowers off stems as you pick. Even with beautiful bunches of de-stemmed flowers, the cordial may have a bitter after-taste, which you may or may not like, depending on your affinity to bitter flavors. The recipes that I found all instruct you to infuse the flowers overnight. However, I noticed that immediately after infusing the flowers, the syrup tasted flavorful without any bitterness. Half an hour later, the flavor was is much stronger but bitter tannin notes popped up. The resulting drink, once diluted with water, only had mild tannin afternotes. Even so the next time, I will only let it infuse for 10 minutes before straining out the flowers. For the final cordial, I added citric acid to give it a sour refreshing taste. The almond flavor of the flowers alone is lovely, but a little cloying. Many recipes use lemon for this. The leaves of the meadowsweet plant also make a nice tissane. I stripped off a couple of leaves and put them in a mug and poured boiling water over it. After it had infused for two to three minues, I drank it. It has a clean grassy flavor with a nutty overtone. In a large pot, put in the sugar and the water. Bring the water to a boil and let cook until all the sugar is fully dissolved. 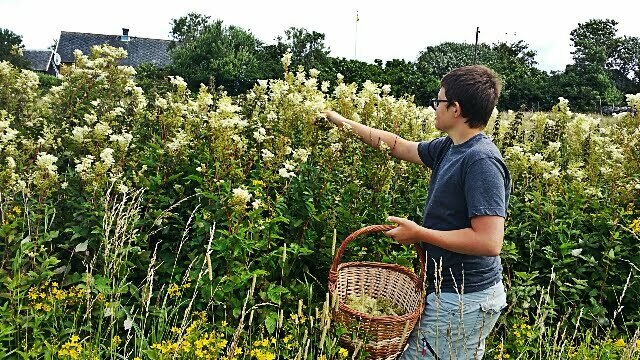 Pick over the meadowsweet flowers, making sure you have as little stems as possible. The stems and leaves of meadowsweet contain salicylic acid, which is a main component in aspirin. While the amounts in the cordial are not enough to be really medicinal, the stems can make the drink bitter. Once the sugar is dissolved, take the pot off the stove and add in the meadowsweet flowers, citric acid and the sodium benzoat and stir very well. The citric acid will give it a pleasant sourness and complexity, which I think is refreshing against the honey almond flavor of the flowers. The sodium benzoat is a preservative. You can leave it out, if you like, but then you should either keep the finished saft in the refrigerator or freeze it. If you do use the sodiumbenzoat, do NOT add it to the water while you are boiling it. This can make your saft very bitter flavored. Stir the mixture and leave it to sit for 10 to 15 minutes. Strain out the flowers by pouring the mixture through a fine sieve. I do it first through the finest colander I have, which takes away most of the flowers but leaves some petals. Then I use a plastic and fabric coffee filter that I bought very cheaply to strain the rest. Decant into clean, sterilized bottles. If you have used the preservative, the cordial can stand in the cupboard. If not, then keep it in the refrigerator or freeze it in baggies. Note: While I generally have made cordial and kept it in bottles at room temperature, just lately I have had problems with molding and yeasting. I have gotten tired of throwing away gorgeous bottles of cordial away, so I have decided to store all my cordial now in the freezer. To serve, add cold water or fizzy water to taste.